Jackknife is a fun exercise to do and one that has many layers. Each rep you can try to get more length and more height! I love, love, love doing Jackknife on the Mat! 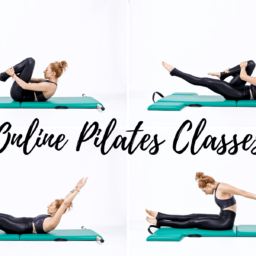 It looks quite difficult and complicated and I’m not going to lie it is challenging and there is a bit to think about while doing it, but it’s not so different from the beginner and intermediate exercises you have been doing already. If you are doing the roll over and Double Straight Leg Stretch, you can start to add this in and when you’ve got the movements down begin challenging yourself with the precision and control that Jackknife requires. It will truly help you master the Corkscrew, High Scissors and High Bicycle. I love, love, love doing Jackknife on the Mat! If you have a mat with poles, place your hands on the poles and reach into them from your back. Maintain on long neck by looking to the ceiling and then lengthen your legs long and together.. Lift your legs and seat up and overhead parallel to the floor. Then reach them to the ceiling with your toes over your eyes. With control begin to lengthen your body towards the floor and once your seat touches lower your legs to where you can with control and repeat. Ideally you try to touch the mat! Repeat three to five times. You can prep yourself for this exercise by starting with your legs straight up to the sky and then going overhead. One of the things to be watchful for in this exercise is momentum. As you take your legs overhead reach them to the wall behind you. They will want to drop down but if you can control this exercise you’ll find a great stretch of your back and strength to lift your legs up. Once the legs are up the next part is the hard part-Controlling the decent. As you lower your body towards the mat your legs must not drop down onto your body or back overhead where they came from. Continue to reach your legs up as you roll your body down. Then, stretch them long as you lower them, reach them long to lift up and over as you repeat! Jackknife is a fun exercise to do and one that has many layers. Each rep you can try to get more length and more height!